There have been a flurry of polls following the announcement of the draft Brexit deal – all have tended to show a negative reaction. The most thorough were full length polls from YouGov for the Times and Survation for the Mail. YouGov’s full length poll found that, based on what they had seen or heard about the deal, 15% of people supported it, 51% were opposed, 33% said don’t know (their snap poll earlier in the day had figures of 19% support, 42% opposed). Presenting people with a brief summary of what the deal actually entails makes little difference – by 50% to 19% people think it is a bad deal for Britain, by 45% to 28% people think it does not respect the result of the referendum. In Survation’s poll 61% said they had heard some details of the deal, and of those people who had heard at least something about the deal, 27% said they supported it, 49% were opposed. YouGov asked people what should happen next – only 16% of people thought Britain should accept the deal as it is, 11% would prefer to reopen negotiations and seek a better deal, 19% to leave without a deal, 8% to have a referendum on the deal and 28% to just remain in the EU after all. In practice, of course, some of these options may not realistically be on the table. If people were forced to choose between the deal or leaving without one, 60% would choose the deal, 40% no deal. On the other hand, if the choice was between the deal and having a fresh referendum, people would prefer a new referendum by 56% to 44%. Survation’s poll included some similar choices (though unlike the YouGov ones, they didn’t force a choice, people were able to say don’t know). If there was as referendum between the deal or remaining, people said they would prefer remain by 43% to 34%. If there was a referendum between the deal or no deal, people would prefer no deal by 34% to 32%… but with 34% don’t knows, who were largely remainers (and, if push comes to shove, I suspect may prefer a deal over no deal). Turning to May’s own future, YouGov found that 33% of people think she should stay, 47% think she should resign. The figures in the Survation poll were very similar – 33% thought she should stay, 50% that she should go. Naturally there was more support among Tory voters, but even many Tory supporters think May should go (43% in the YouGov poll, 30% in the Survation poll). There is, however, little optimism that a change of leader would produce a better outcome. In YouGov’s poll only 27% of people thought that a different Tory Prime Minister would be able to get a better deal (and only 19% thought that a Labour government under Jeremy Corbyn would get a better deal). They were a little more optimistic in the Survation poll, where 38% thought getting rid of May would increase the chances of a good deal. In short, people don’t like the deal, but there is relatively optimism about the opportunities for anything better. If forced to choose, people would accept the deal rather than leave with no deal, but they’d also rather have a fresh referendum than accept this one. Whether public opinion really matters at this point is a different matter – this is one of those issues where Parliamentary arithmetic (and the internal politics of the Tory party) will be the actual deciding factors… they may be influenced by public opinion but, outside there being another referendum, public opinion is not going to be decisive. 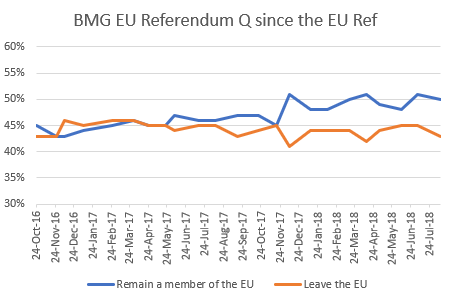 While there hasn’t been a lot of voting intention polling in recent weeks, there has been quite a lot of Brexit polling – those organisations campaigning for or against it used the summer holidays to get a good bite of publicity. This included some large polls from YouGov for Hope Not Hate and the People’s Vote campaign showing Remain at 53% and Leave at 47% if there was a referendum now. 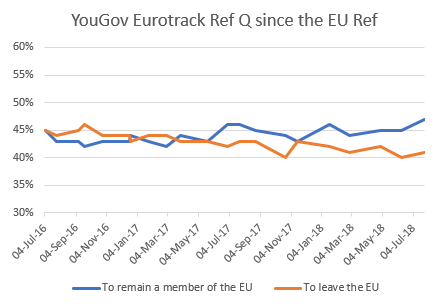 Today there was a new NatCen poll that showed Remain at 59%, Leave at 41% (though do check the important caveat from John Curtice’s report that the sample itself had too many 2016 Remain voters, so it actually implied a position along the lines of Remain 53/54%, Leave 46/47%) and a Survation poll showing Remain at 50%, Leave at 50%. In terms of what to make of this, I’d give the same advice on support or opposition to Brexit as I do on voting intention. There are an awful lot of polls asking about support for Brexit, and a lot of people inclined to cherry-pick those which they agree with. Don’t pay too much attention to individual polls (especially not “interesting” outliers), watch the broad trend instead. 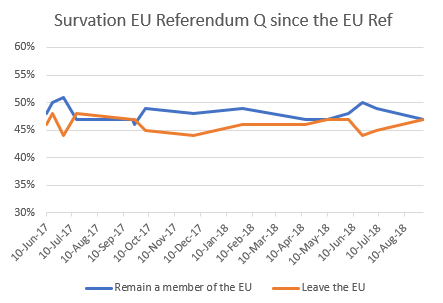 The Survation series didn’t start until 2017 – since then their polls have varied between neck-and-neck and small leads for Remain. On average this year their referendum polls have shown Remain 48%, Leave 46% (51% Remain, 49% Leave without don’t knows). Unlike the other two referendum polls Survation weight their referendum question by likelihood to vote which, given that previous non-voters tend to split in favour of remain, probably explains the slightly lower remain lead. The most regular comparable poll isn’t asked as referendum VI, but is YouGov’s tracker for the Times asking if people think Britain was right or wrong to vote to Leave the EU, normally asked weekly. 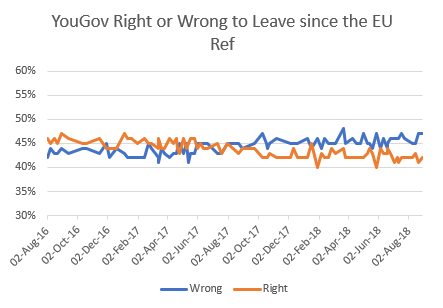 The pattern should be familiar – in late 2016 the poll consistently showed people thought Britain was right to leave, in early 2017 it began to flip over, and it now consistently finds more people think Britain was wrong to vote to Leave. On average this year 46% of people have said Brexit was the wrong decision, 42% the right decision (without don’t knows, it would be 52% wrong, 48% right). So while the movement across the polls has not been massive (was are generally talking about a swing of 3 to 5 points from the referendum result), given the closeness of the 2016 result that is enough to mean polls are consistently showing slightly more people opposed to Brexit than in support of it. There is one important caveat to add to this. If you look at the breakdown by 2016 referendum vote you will often find the number of Leave voters switching to Remain is that that much larger than the number of Remain voters switching to Leave (if it is larger at all! ), this is because polls generally find those people who did not vote in the 2016 referendum tend to split in favour of Remain.